Goddess Green Tara is one of the principal deities of the Buddhist pantheon. To realize the symbolism behind her, we first have to understand the meaning of the word 'Tara', which in Sanskrit means to cross over. Hence, Tara is the goddess who helps us to cross over the ocean of miserable existence that is samsara. 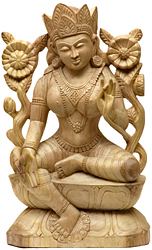 There are many different manifestations of Goddess Tara in Buddhism like White Tara, Red Tara, Green Tara, Yellow Tara etc, each of whom has unique characteristics distinguishing her from the other Taras. In the case of Green Tara, the primary distinguishing feature is obviously her color which resembles the watery green of an extremely pure emerald. Another exceptional attribute of her iconography is the placement of her legs, with the left pulled back and the right always extended. The latter symbolically shows her readiness to rise and rush to the defence of her devotees whenever they are in the need of her help. She protects from both physical and mental calamities. Thus obviously the most prominent attribute of Green Tara is her compassion, which is not surprising taking her origin into consideration. A bodhisattva in her own right, she is nevertheless said to have emerged from the tears of Avalokiteshvara, the most popular bodhisattva of Tibet and the presiding deity of compassion. In fact, it was on seeing the plight of a suffering humanity that Avalokiteshvara had shed those tears which eventually gave rise to Green Tara. Thangka Paintings of Godess Green Tara: Handmade paintngs from Kathmandu, Nepal, made by artists trained by monks associated with Buddhist Monasteries. Thangka paintings are created observing all canonical norms as per Tibetan traditions. Most paintings take weeks to create. Presenting the largest collection of statues of the Goddess Green Tara, made of brass, copper, and wood. All statues are made by hand, by artisans from different parts of Nepal and India. Nepalese statues are made with copper, using the lost-wax method, and gilded with 24 karat gold.